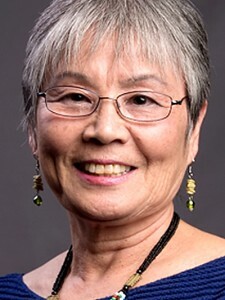 Yasuko Sakamoto, Little Tokyo Service Center’s (LTSC) longtime director of social Services, will retire in June, according to Executive Director Dean Matsubayashi. In 1980, Sakamoto became LTSC’s first social worker a few months after founding executive director Bill Watanabe assumed the helm of the fledgling social service organization. When Watanabe retired in in 2012, Sakamoto became LTSC’s longest-serving employee. A native of Fukushima and a graduate of the School of Social Work at UCLA, Sakamoto became a licensed clinical social worker (LCSW) in 1988 to provide counseling and psychotherapy to clients in Little Tokyo and the broader Japanese American community throughout Southern California. 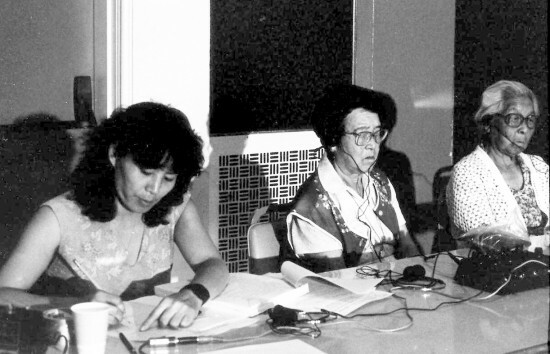 Yasuko Sakamoto serving as an interpreter in 1984. Over a period of three decades, Sakamoto conducted community education seminars in Los Angeles and Orange counties on many topics, including caregiving, dementia, depression and domestic violence. She has also been a speaker at various international conferences and seminars in Japan. Sakamoto was also instrumental in developing strong working relationships with the City of Los Angeles Department of Aging, Los Angeles County Department of Children and Family Services and Department of Mental Health and other governmental agencies, to bring resources and connections to the Little Tokyo and Japanese American communities. Among other foundations and partner agencies Sakamoto worked closely with are Center for the Pacific Asian Family, Alzheimer’s Association and Special Service for Groups. With every organization, she developed a reputation for integrity, competence and compassion, as she nurtured relationships of mutual respect. “Yasuko Sakamoto is an extraordinary and very modest leader. She sees needs within her community and thoughtfully develops strategies and tactics to fill them,” said Debra L. Cherry, Ph.D., executive vice president of Alzheimer’s Association California Southland Chapter. “She is a pioneer in the realm of dementia care for Japanese Americans. She developed this region’s (and possibly this nation’s) first support group for Japanese American families caring for people with Alzheimer’s disease. She used her cultural insights to adapt this intervention so that it better suited people from a Japanese background. 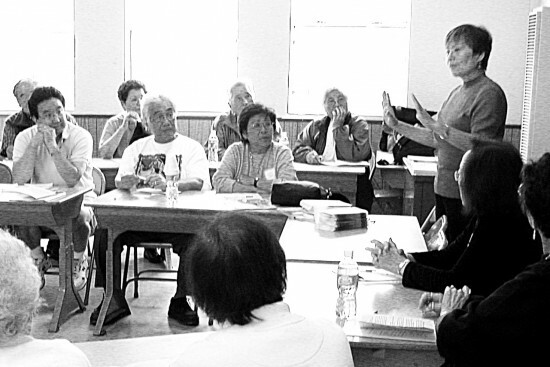 Yasuko Sakamoto conducting a caregiver workshop in 2007. Apart from her own staff, two of Sakamoto’s closest associates in the Japanese American community are Debra Nakatomi, president of a communications firm and the president of LTSC’s Board of Directors, and Linda Yamauchi, president of the Los Angeles County Commission on Aging and a member of LTSC’s board. “When I think of Yasuko … I think of her passion, her depth of character, her talent as an artist and calligrapher, her wisdom, knowledge and experience. She is a woman who gets things done. She is the most selfless person I know, always finding time to help others,” Yamauchi reflected. Nakatomi recollected, “For over her 35 years as the leader of LTSC’s social service program, Yasuko’s wise and trusted counsel has been sought by families and professionals alike. Yasuko embodies kindness and compassion in her work and life and can always be counted on for insightful advice on caregiving and meeting the needs of families and seniors in our community. LTSC, which celebrated its 35th anniversary in 2015, has grown into a multi-faceted nonprofit organization, and the social service department under Sakamoto’s leadership made important strides. Speaking for all 130 employees of LTSC, Matsubayashi said, “We still have Yasuko with us for another six months, but already, we know how much her daily presence in the office will be missed. Retirement luncheon and program will be held on Saturday, May 7, at Los Verdes Golf Course in Rancho Palos Verdes. Details to come.